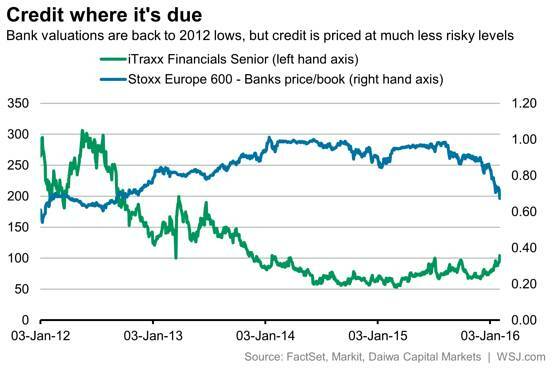 Despite plummeting shares, European banks are being treated gently in at least one market: credit. With equity valuations sinking back to levels last seen in 2012, and the height of the euro crisis, some analysts are wondering whether investors should be a little more concerned about credit risks. The price to book ratio of the Stoxx Europe 600′s banks – a key measure of the sector’s value — has now tumbled to levels seen in 2012, during the back end of the euro crisis. Then, investors were concerned that the continent’s banking system was under threat from a potential collapse of the monetary union. That concern was reflected in the cost of insuring against the default of European banks. This time round, credit has not moved anywhere near as much, according to research by Daiwa Capital Markets. That’s according to the iTraxx senior financial index, which monitors the prices of the credit default swaps that are used to protect investors in bank debt from the risk of default. During the summer of 2012, the price of bank’s CDS was almost three times what it is today. Though Europe’s economic outlook isn’t quite so bleak today, the recovery has been lackluster. Bank lending had only recently turned positive in the region, and the legacy issue of non-performing loans is still a headache, particularly in Italy. What’s behind the nonchalance in credit? Mr. Lichwa said that regulatory and economic shifts since 2012 are part of the reason that credit has not reacted so violently this time. For a start, banks have built up much bigger capital cushions to absorb losses. 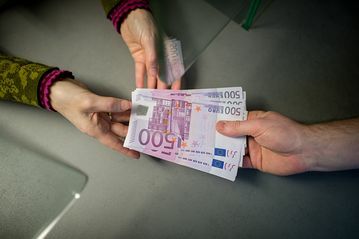 Banks also don’t have the same short term liquidity risks now thanks to the billions of euros that the European Central bank has flooded into markets, said Chris Tefler, portfolio manager at ECM asset management. For Dan Davies, at independent research house Frontline Analysts, the decline in stocks is largely a reflection of the decline in projected earnings. “That’s obviously not good news for anything in the capital structure, but earnings are not at levels which look like generating capital-destroying losses,” Mr. Davies said. Shares are also falling because dividends are being cut and cancelled, Mr. Davies said. That would typically benefit credit. But other analysts ask if the credit market is just being too sanguine over risks. Mr. Lichwa notes in his research that banks would be “very vulnerable” to an economic downturn. That means that credit markets could also be vulnerable to a correction, if investors start to believe the outlook for European banks is bleaker than they expected.